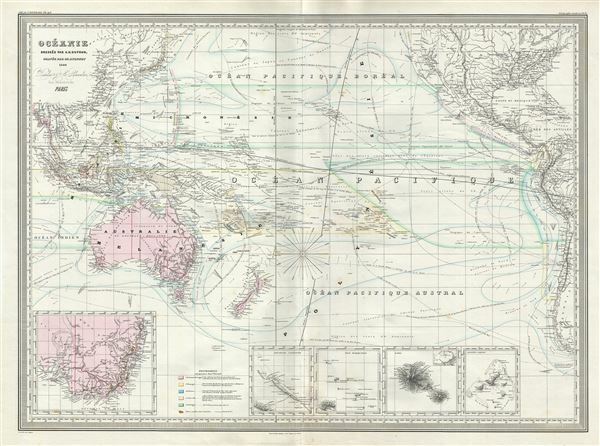 This is an impressive 1860 elephant folio map of Australia, New Zealand, Polynesia and the Pacific Ocean by A. H. Dufour. It covers from Burma (Myanmar) east as far as Chile and from Japan south to New Zealand. Although the interiors of the continents remain blank, the coastal regions are highly detailed. Numerous islands of Polynesia, Melanesia and Micronesia are noted. Five insets are features along the bottom border of the map. These include an inset of New South Wales, Australia, showing gold locations, New Caledonia, Martinique Island, Tahiti and the Gambier Archipelago. The map shows extraordinary detail throughout noting European possessions in Australia and southeast Asia, cities, islands, rivers, lakes, mountains, oceans and ocean currents, sea routes of explorers and a host of other geographical, topographical and physical features. This map was prepared by Auguste-Henri Dufour and engraved by Charles Dyonette for publication plate no. 40 in Armand Le Chevalier's 1860 edition of Atlas Universel, Physique, Historique et Politique de Geographie Ancienne et Moderne.